This page introduces several terminal-based working environments available on UCR’s HPC cluster that are useful for a variety of computer languages. To work efficiently on remote systems like a computer cluster, it is essential to learn how to work in a pure command-line interface. GUI environments like RStudio and similar coding environments are not suitable for this. In addition, there is a lot of value of knowing how to work in an environment that is not restricted to a specific programming language. Therefore, for working on remote systems like HPCC Cluster, this site focuses on Nvim and Tmux. Both are useful for many programming languages. Combinded with the nvim-r plugin they also provide a powerful command-line working environment for R. Users of Emacs may want to consider using ESS instead. 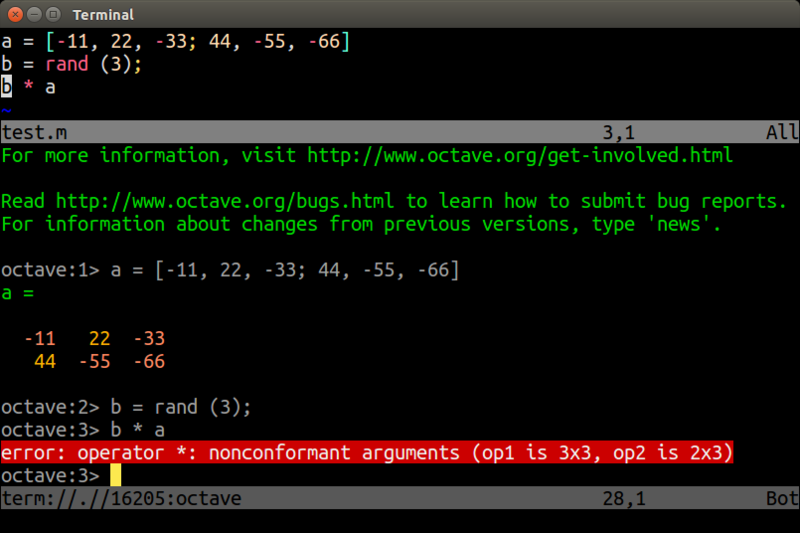 The following provides a brief introduction to the Nvim-R-Tmux environment. i: The i key brings you from the normal mode to the insert mode. The latter is used for typing. Esc: The Esc key brings you from the insert mode back to the normal mode. :: The : key starts the command mode at the bottom of the screen. Use the arrow keys to move your cursor in the text. Using Fn Up/Down key allows to page through the text quicker. In the following command overview, all commands starting with : need to be typed in the command mode. All other commands are typed in the normal mode after pushing the Esc key. :w: save changes to file. If you are in editing mode you have to hit Esc first. Tmux is a terminal multiplexer that allows to split terminal windows and to detach/reattach to existing terminal sessions. Combinded with the nvim-r plugin it provides a powerful command-line working environment for R where users can send code from a script to the R console or command-line. Both tmux and the nvim-r plugin need to be installed on a system. On HPCC Cluster both are configured in each user account. If this is not the case then follow the quick configuration instructions given in the following subsection. Skip these steps if Nvim-R-Tmux is already configured in your account. Or follow the detailed instructions to install Nvim-R-Tmux from scratch on your own system. Log in to your user account on HPCC and execute install_nvimRtmux. Alternatively, follow these step-by-step install commands. To enable the nvim-R-tmux environment, log out and in again. Follow usage instructions of next section. Note, running Nvim from within a tmux session is optional. Skip this step if tmux functionality is not required (e.g. reattaching to sessions on remote systems). Open a *.R or *.Rmd file with nvim and intialize a connected R session with \rf. This command can be remapped to other key combinations, e.g. uncommenting lines 10-12 in .config/nvim/init.vim will remap it to the F2 key. Note, the resulting split window among Nvim and R behaves like a split viewport in nvim or vim meaning the usage of Ctrl-w w followed by i and Esc is important for navigation. Single lines of code can be sent from nvim to the R console by pressing the space bar. To send several lines at once, one can select them in nvim’s visual mode and then hit the space bar. Please note, the default command for sending code lines in the nvim-r-plugin is \l. This key binding has been remapped in the provided .config/nvim/init.vim file to the space bar. Most other key bindings (shortcuts) still start with the \ as LocalLeader, e.g. \rh opens the help for a function/object where the curser is located in nvim. More details on this are given below. The main advantages of Neovim compared to Vim are its better performance and its built-in terminal emulator facilitating the communication among Neovim and interactive programming environments such as R. Since the Vim and Neovim environments are managed independently, one can run them in parallel on the same system without interfering with each other. The usage of Neovim is almost identical to Vim. \rf: opens vim-connected R session. If you do this the first time in your user account, you might be asked to create an R directory under ~/. If so approve this action by pressing y.
Ctrl-w w: jumps cursor to R viewport and back; toggle between insert (i) and command (Esc) mode is required for navigation and controlling the environment. Ctrl-spacebar: omni completion for R objects/functions when nvim is in insert mode. Note, this has been remapped in init.vim from difficult to type default Ctrl-x Ctrl-o. To install it, one needs to copy from the vimcmdline resository the directories ftplugin, plugin and syntax and their files to ~/.config/nvim/. For user accounts of UCR’s HPCC, the above install script install_nvimRtmux includes the install of vimcmdline (since 09-Jun-18). The usage of vimcmdline is very similar to nvim-R. To start a connected terminal session, one opens with nvim a code file with the extension of a given language (e.g. *.sh for Bash or *.py for Python), while the corresponding interactive interpreter session is initiated by pressing the key sequence \s (corresponds to \rf under nvim-R). Subsequently, code lines can be sent with the space bar. More details are available here.